“The National Supercomputing Center in Shenzhen plans to build a next-generation supercomputer that will be 10 times faster than the world’s current speed champion, a senior executive said. “The investment is likely to hit 3 billion yuan ($470.6 million), and key technologies for the supercomputer are expected to be developed independently,” Wang Zhenglu, director of the project management department of the center told China Daily. 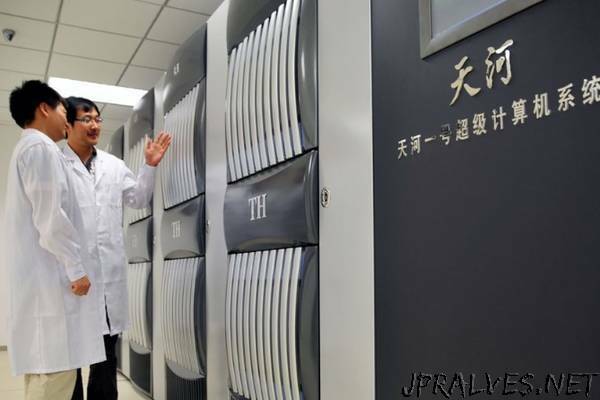 The supercomputer will be “exascale”, meaning that it will be capable of making a quintillion (1 followed by 18 zeros) calculations per second, much faster than the current No 1 supercomputer, Sunway TaihuLight, Wang said. The new supercomputer is expected to be developed by 2020. The exascale supercomputer will play an important role in promoting the development of the Guangdong-Hong Kong-Macao Greater Bay Area, especially in cloud computing, big data and artificial intelligence, he said. Supercomputers are a new driving force in China’s computer innovation and are important for the nation’s information security. China has established six supercomputing centers, in Tianjin, Guangzhou, Wuxi, Changsha, Jinan and Shenzhen. China is now at the vanguard of supercomputer development, having raced ahead of the United States and Japan. The latest biannual ranking of the world’s 500 fastest supercomputers showed China’s Sunway TaihuLight and Tianhe-2 are the world’s fastest and second-fastest machines, with Titan from the US in fifth place. The Shenzhen center, founded in 2009, has focused on high performance computing and cloud computing. It maintains leading positions in a variety of areas like weather forecasting and disaster prevention. The center’s work in detailed exploration and large-scale data processing has helped a domestic petroleum company reduce petroleum exploration costs. The growing shortage of cloud computing resources led the center to recently purchase 420 more rack-mounted servers, 10 graphics processing servers and a group of storage systems to expand its computing resources.